Blaine Colton is pulled into a chilling conspiracy when he discovers embryonic clones with his name on them.Suspecting the research has breached ethics agreements, he brings close friends, Sophie and Jett Faraday, in on a scheme to find answers. Immediate threats reveal not everyone is happy about his discovery. The reappearance of an identity from Blaine's past unsettles him further, and then a crisis fractures his world. Convinced his research objections and the tragic events arelinked, Blaine pursues justice. But someone is watching him. Someone wants him dead.Replicate continues the story of Blaine from Adele Jones's Integrate. 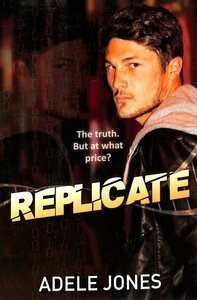 About "Replicate (#2 in Integrate Series)"
With a longstanding interest in historical fiction, Adele Jones based her Master's dissertation on this topic. She has also had a variety of poems, short stories, inspirational meditations, devotions and magazine articles published. Her first YA novel Integrate was awarded the 2013 Caleb Prize for an unpublished manuscript. Customer Reviews For "Replicate (#2 in Integrate Series)"
This second YA novel in the trilogy, by Adele Jones, has picked up the pace a number of notches. The drama has intensified, the action has heated up, and the romance is getting some legs. It was a page turning read, and annoyingly, left up in the air for the third book to pick up. I enjoyed the reading experience, and am intrigued. The violence and mild coarse language may be a concern for parents of younger readers. I'd probably rate it PG. In this sequel to 'Integrate', Blaine Colton's nemesis is behind bars awaiting trial. However, the 18-year-old mitochondrial disease survivor's woes are far from over. The troubling heat spikes he's been experiencing may mean his miracle cure is unravelling. He's also just discovered that embryonic clones of him are being  developed without his knowledge or consent. Something big is going down at the Advanced Research Institute; something that could cost Blaine everything and put his loved ones in danger. Add to the mix the birth mother who's tracked him down, an international crime ring, and the microbiology intern who's won his heart, and you know this is going to be anything but a smooth ride. I really enjoyed the first book in this series, but I think this one is even better. At one level, it's a fast-paced thriller with lots of twists and turns, but there are deeper issues underneath to do with identity, faith and the value of human life. The author has an engaging writing style, with plenty of strong verbs and imagery to bring the scenes to life. The unfolding love story is also done really well. If you like suspense and conspiracy theories, mixed with deeper issues and a little romance, you'll enjoy this book. Disclaimer - I provided some feedback on a very early draft of this book. Blaine Colton had been handed a genetic death sentence until revolutionary gene therapy changed his life. Living a relatively normal existence, he is called to an unscheduled post-treatment appointment just weeks before his eighteenth birthday. Informed that his life saving procedure was never approved, he is held against his will for his status as an apparent illegal GMO. Subjected to constant testing, refused contact with his parents and deprived of life sustaining medication, Blaine begins to suspect that something is wrong. Wanting answers, he escapes the Institute and ambitious Chief Scientist, Dr Melissa Hartfield. Now a fugitive with a failing body, Blaine must find Professor Ramer, the developer of his therapy. But the Professor has vanished and time is running out. Fast.